Design custom lanyards in a few simple steps. Upload your own design & logos. Our professional design team review every lanyard before we print them. We produce your lanyards within 2-3 weeks and deliver them absolutely free. Make your own lanyards with ID&C! Using our new lanyard maker, you can create custom lanyard designs in minutes. Whether for promotional, security at events or just for fun, lanyards are a great way to stand out. Our online custom lanyard designer is the most advanced in the world. In a few easy steps you can make your own lanyards with custom colours, text, logos and attachments. Making your own lanyards with our designer couldn’t be easier. Watch our short video or jump straight in and try your hand at designing. If you're not sure what lanyard you want yet, or you want to ask a question then take a look at our full range of lanyards, including plain, custom and pre-printed. ID&C offers its customers the best experience possible. With our high quality custom printing and fast delivery, we ensure a reliable service on time, every time. Don’t just take our word for it though, see our customer feedback below. HOW DO I DESIGN MY OWN LANYARDS? 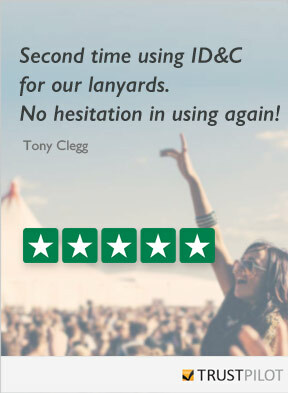 Our custom lanyards received an average of 9.3 out of 10 based on 740 reviews.